This week, Cody talks Hobo with a Shotgun and The Set-Up, while Jay takes notice of The Evictors. When the Robert Rodriguez/Quentin Tarantino double feature Grindhouse was nearing its 2007 release, a contest was held for amateur filmmakers to create their own trailers for nonexistent grindhouse movies like those contained in Grindhouse, which were made by Rodriguez, Rob Zombie, Edgar Wright, and Eli Roth. The winning trailer would be attached to select theatrical prints. 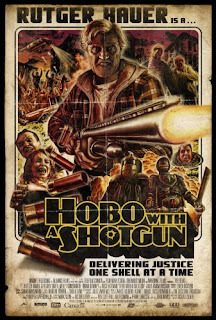 The winning entry was Hobo with a Shotgun, from Canadian filmmakers Jason Eisener, John Davies, and Rob Cotterill. Rutger Hauer stars as the titular hobo, first seen riding the rails as a variation on the theme of the heartwarming classic Cannibal Holocaust plays on the soundtrack. He decides to hop out of his boxcar at the small city of Hope Town and within moments of arriving finds that it's a crime-ridden hellhole. The streets are filled with violence, punks, scumbags, prostitutes, and corrupt cops. The residents, homeless and homeowners alike, live in fear. The local crime boss is Drake, who presents elaborate public executions like a demented game show host. Drake is backed up by his insane sons Slick and Ivan, who speed around in a white Bricklin and wear letterman jackets and sunglasses while emulating Risky Business-era Tom Cruise. Drake's headquarters is a rec center that's been turned into a literal carnival of violence, complete with head-smashing bumper cars and foot-mangling hammer games. The hobo would rather stay out of things, he just wants to keep to himself and raise enough money to buy a lawnmower and start a landscaping business, but the crime and violent situations are unavoidable and build up around him until he can't take it anymore. He buys a shotgun and sets off on a one-man mission to clean up the streets, befriending a young girl named Abby along the way and getting on Drake's bad side as he delivers justice one shell at a time. Back and forth attacks escalate, with Drake ordering the murder of all hobos and eventually summoning The Plague, an armored, almost otherworldly pair of assassins who have eliminated many popular figures throughout history and even have an arcade game based on them. This movie is awesome, completely ridiculous and over-the-top and clearly influenced by '80s Troma films. It's well-directed, with excellent gritty, colorful cinematography from Karim Hussain, and is full of gore, entertaining performances and great, funny lines. I highly recommend checking it out. It's available On Demand now, will be in theatres May 6th, and hits DVD/Blu-ray on July 5th. Now I continue to hope for a feature length version of Eli Roth's Thanksgiving. 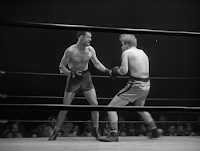 Stoker Thompson is a beaten down boxer past his prime. At thirty-five years old, he's considered an old man in the sport and recently he's been on a losing streak. His wife is tired of watching him take beatings from younger fighters and wants him to quit, but he's still optimistic about his chances. He's always "just one punch away" from greater success. It's fight night and Stoker's manager Tiny has made a deal with the criminal manager of his opponent that Stoker will take a dive in the third round. Tiny has so little faith in Stoker's abilities at this point that he doesn't even let him in on the plan, assuming he'll just legitimately lose around the right time. One interesting aspect of The Set-Up is that the story is told in real time, covering the last seventy-two minutes of Stoker's career. Once Stoker reaches the ring, we see the whole fight, intercut with crowd reaction, in a fantastic sequence that's nearly twenty minutes long. It's a really good film, directed by Robert Wise and based on a poem by Joseph Moncure March, with a great cast led by Robert Ryan as Stoker. 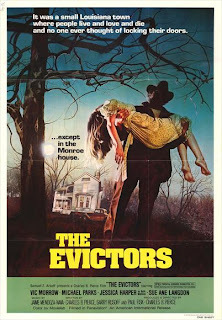 The Evictors is a nice little late '70s horror/thriller based around a house with a terrible history. The setting (both in time and place) are interesting to me as the film takes place in Louisiana in the early 1940s but flashes back even further on a few occasions. 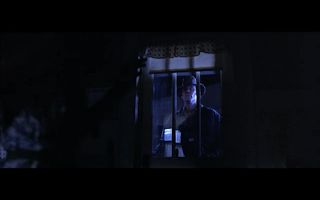 Ruth (played by Suspiria star Jessica Harper) and Ben (played by Michael Parks) move into a country home and like so many times in films such as these they soon discover that there's a reason the house was vacant in the first place. Stories of murder begin to surface and Ruth receives a message in the mail telling them to move out. One night soon after, Ruth sees a man on the porch in a very atmospheric setting that makes nice use of darkness and rain. This film has quite a few twists and turns at the end but I saw pretty much all of them coming. Still, it was an enjoyable enough watch and there is good use of location and isolation throughout. Jessica Harper and Michael Parks are both very solid and there is a "burned alive" set-up during one of the flashbacks that has stuck with me days after viewing. I can't mention this with out talking about the poster work for it as well. It's really awesome, as you can see below!